Yes, you need to take your Senior Seminar, ENG 444. You’re an English major and if you want to graduate, you gotta do it. I know that the amount of reading, writing, and research required in these courses is a little daunting. But maybe you’re interested in an English class that’s a bit more than reading, writing, and research anyway? Maybe you also want something visual, maybe something historical, or even political? Maybe you want to study the where just as much as the who or what. Lucky for you, this hypothetical course I’m describing is an actual course! 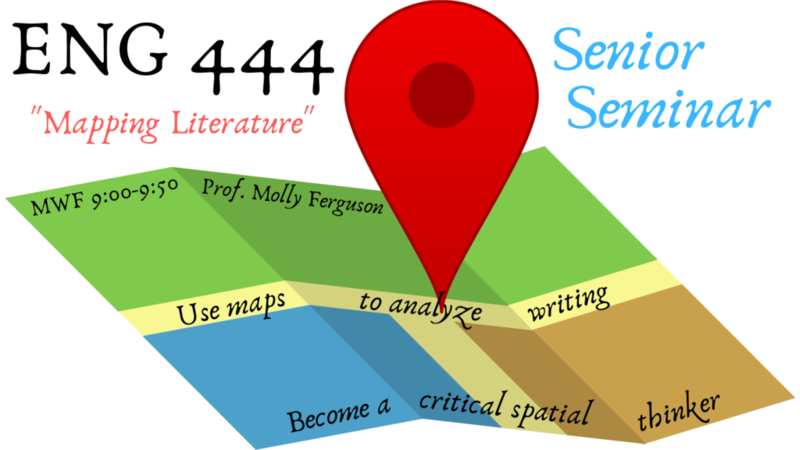 Prof. Molly Ferguson will be teaching ENG 444 “Mapping Literature” in Fall 2019, a course dedicated to the literary art of reading and creating maps. If you’re an English major like myself, you see the word ‘map’ and react like a vampire in sunlight. If you can stop your flesh from combusting for two seconds, let me tell you why you’re wrong to think that way. I’ve been conditioned to only use maps when I’m driving to a new location and need to GPS on the way. So maybe, in a Pavlovian sense, I’ve associated maps with the sound of my voice when I yell at someone tailgating my car. In that conditioning, however, I lost the joy I used to get when I opened a history textbook or dictionary to a brightly colored world map. 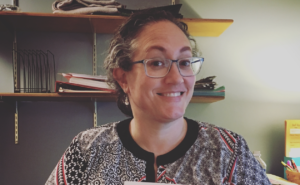 Throughout the course, Prof. Ferguson introduced a myriad of map-analyzing skills that allowed the class to find a new appreciation for the literary and linguistic techniques required in crafting a map. It was a way of looking at the location of a story as a type of character. That character influences the plot just as much as the protagonists and antagonists. For the first time in my collegiate education, we were shown maps of places that you couldn’t go to. The premiere example was from the first installment of Ursula Le Guin’s Earthsea book series. Up to this point, map-making seemed like a rigid process that required immense amounts of fact-checking. But, the fictional map concept allows for a lot of freedom for the writer, especially writers favoring creative, fantastical, or sci-fi stories. Additionally, I learned fictional maps demand research, too. It’s difficult to make a magical map without some sort of grounded framework. At the course showcase: Thom Pensinger, Keli MacDonald, and Bonnie Prindle. 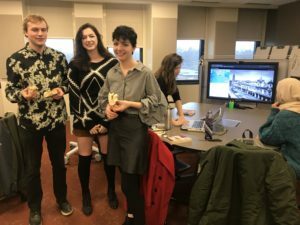 By the end of the semester, we all created ‘story-maps’ that were tied to creative or research papers that we wrote. Although they had to tie to some kind of text that we’d examined in the course, it still allowed for much more artistic opportunities than I would’ve imagined prior to taking the class. Check out some of the amazing maps that my class created. Mine is number 5. This last point matters the most to me. During the course, we read Sara Novic’s book Girl at War, a story about a young woman who escaped the civil war in Yugoslavia. Coincidentally enough, my parents had to do something similar in the early-to-mid 90s. For my final project of the semester, I interviewed my mom. During the interview, I used the text from class as a basis for her to describe our family’s emigration from war-time Bosnia. I learned new things I hadn’t known prior, and genuinely found new respect for my family. I wasn’t alive at the time, so my mother’s storytelling is the only thing I have of my family’s experience. And I wouldn’t have gotten such nuanced, detailed answers if it wasn’t for the ‘story-map’ assignment that was inspiring my questions. So, to be a momma’s boy, the course made me appreciate my mom in a new way too. I’m not going to promise that you’ll find new appreciation of your family if you take this course, but I will say that there’s something for everyone. It’s a unique class subject taught by a great professor. The readings are multicultural and the maps range from simple to beautiful. As I write this, ENG 444-3 for Fall 2019 with Prof. Molly Ferguson has just three seats left in. Grab one!